Arranging a social meeting often involves collaborative consideration of events, locations and time. In studying online dating, we observed people using multiple information sources and applications to arrange suitable activities and rendezvous locations/times. Would-be socializers then exchange URLs and discuss ideas until a decision is made. To reduce the work of collaborative event planning, we have designed MapChat, a novel, map-based combination of existing services. 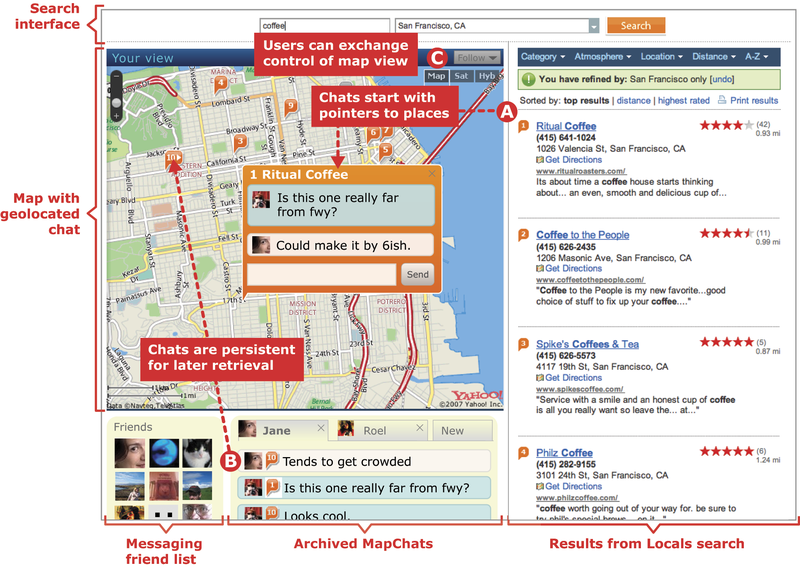 MapChat allows people to chat synchronously over an interactive map, transforming online maps into shared digital environments for place/location exploration and rendezvous negotiation.